Card: XVII Stars – from the Mystical Cat Tarot by Lunaea Weatherstone. Message from the Faeries: Are you feeling lost, or are you feeling at home, with where you are in the Universe right now? If you are feeling at home, then congratulations! We are so happy that you are feeling at ease and cozy with where you are at right now. You are so lucky to be where you are. We hope you appreciate your good fortune. If you are feeling lost right now, please know that you are not alone. The Universe is a rather large place, haha, and to find yourself where you are, right in this moment, and not really understand how you got to where you are, or to know why you are where you are, makes a lot of sense. First of all, it’s hard to observe yourself! Secondly, how can one fathom just exactly where they are in such a vast amount of space? In a lot of ways, it doesn’t actually matter how you got where you are and why you are there. The important part is trusting that you are exactly where you are suppose to be, and that you are here living in the moment. Appreciate the fact that not only are you made up of matter, but also recognize that you matter! This week is about trusting in yourself and trusting that you are exactly where you are supposed to be. Relax and revel in the magnificence of your existence and feel the awe of life itself. Isn’t it amazing?! 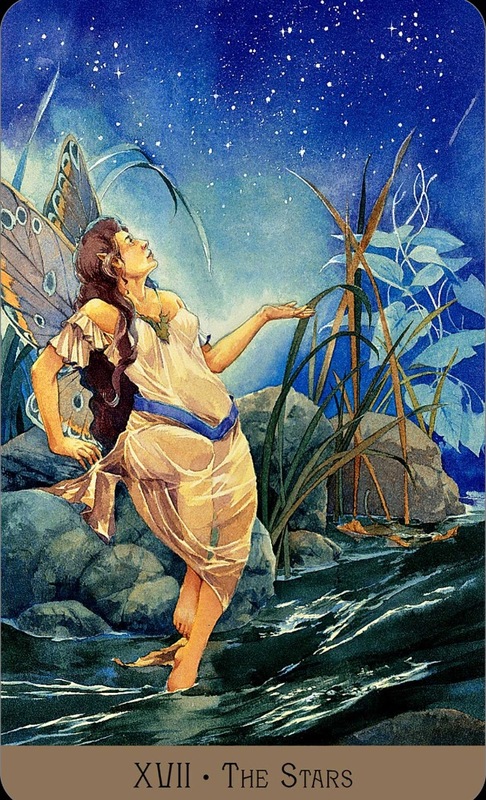 Card: XVII The Stars – from the Victorian Fairy Tarot by Lunaea Weatherstone. Message from the Faeries: How magical are the stars in the sky? They are so incredibly magical and mysterious. They provide light and give life to the planets that orbit them, and they are all unique and different from one another. They come in various shapes and sizes and they all have their one special location in the map of their respective universe. All stars (including The Sun) are living beings. Just like you, stars are born and eventually they die. When a star dies, the light that shone from it still travels far and wide through space. You can still see the star long after it dies. Just as star dust is one of the keys of life and your very own existence, you too will also one die and your dust will become a part of the life force of other living beings. No matter how much you may feel separate from all other life and the universe, the connection between you and everything is undeniable. You are connected to the past and the future. Sometimes you might feel insignificant, but even a person who spent their life as a hermit with limited communication to humanity and nature would still play an integral role in the cycle of life. It’s all stardust at the end of the day. If it not enough for you to realize that you are part of something much greater than yourself, and that you play an important role, even if you don’t feel like it sometimes, we hope that you are able to at least able to feel a connection to the stars in the sky. You too carry a light that shines for all to see. If you do not feel particularly unique or important, remember that all living things are important in the cycle of life. We are all interconnected. The last thing we wish to impart with you this week is simply this – you get to decide how much of light you want to be. How bright do you want to shine? When you die, how long will you remain shining for all to see? What kind of legacy do you want to leave behind? It’s up to you to make the steps towards creating your legacy. We hope you choose to shine brightly.